As I slowly crawl up another incline on my bicycle I check my mirror to see a pack of septuagenarians inching closer and closer. In an instant, the ringing of passing bells mutes the sound of my bike chain. One-by-one the group passes me, most of whom have roughly 40 years on me, and I’m the one out of breath! I could justify my sluggish performance on my recent spike in olive oil and truffle consumption on a recent tour of Istria and Split, but no one likes excuses. Inspired by the cycling of others in my group, I take a deep breath, gear-up and spin my legs a little faster. Not long after, I reach the peak feeling satisfied by the sweeping views of the Adriatic Sea and by my ability to keep on pushing. I’m in Croatia, on the island of Brac, on a cycling tour with USTOA tour operator and member, VBT Bicycling and Walking Vacations which will take me through the islands of Brac and Hvar in the Croatian region of Dalmatia. Our cycling group walking into Postira. The tour started in the town of Split, where I was to meet up with the rest of the tour group before we all ferried to the island of Brac. Upon meeting the group and guides I was growing increasingly more excited. I had never been on an “active” tour before, so meeting everyone and hearing their enthusiasm for cycling, and other cycling trips they had taken in the past was very motivational. With all the continued introductions and chatter the ferry trip went by rather quickly and soon we were at our first destination on Brac, the village of Postira. Postira is a quiet village meant for R&R, and the only thing more eye-catching than the boat filled harbor was the dramatic mountain filled landscapes. One of our guides, Lada, walked us into the village and familiarized us with some of the necessary landmarks before leading us to our hotel. Our guide Lada orienting the group within Postira. After checking in, the group met for a safety and bike fitting session before a short warm-ride to give us a taste of the island. I’m very glad that there aren’t many cars driving on the island of Brac because the sight of farmers harvesting their wine grapes made focusing on the road extremely difficult. Everyone returned from the warm-up ride, and while the group readied themselves for the welcoming dinner that evening, our two guides worked out any kinks people had with their bicycle configurations. Later, the group strolled along the harbor as the sun light waned in the distance. 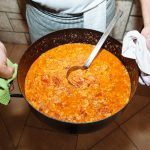 We were led to a family-run restaurant, with smells of garlic and savory spices wafting out, and were greeted with chilled shots of small-batch brandies. Inside we sat down by candle light, the dining hall buzzed with sounds of laughter and conversation. That was until the hostess brought out the main courses, three types of peka cooked proteins. 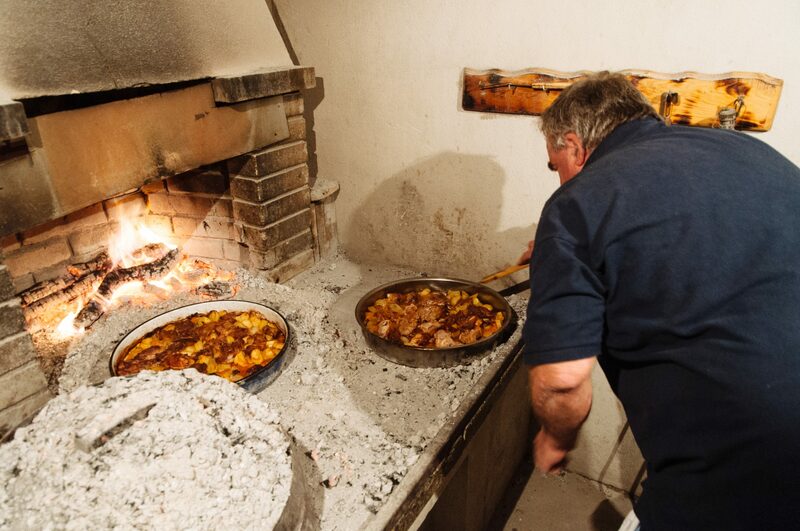 Peka is a method of cooking popular in Dalmatia in which a protein is stewed in a vessel similar to a Dutch oven (just shallower) with sauce, various spices and vegetables. The dish is covered with a metal lid and then fire embers are placed on top. I selected the octopus peka and when I took my first bite I was amazed by the texture as it was akin to the texture of chicken. Beef, fish and octopus being prepared peka style. I woke up the next morning ready for a day full of cycling. We began at a slow pace through winding pastoral roads that led us by fields of fig and olive trees. We were headed to the town of Pucisca with an arduous climb in our way. Just as I thought about motioning for the VBT van to give me a lift, I caught a glimpse of the patchwork white and terracotta buildings of Pucisca. Suddenly, the lactic acid burn in my muscles was an afterthought. Pucisca is a gorgeous seaside village that wraps around the teal Adriatic Sea. 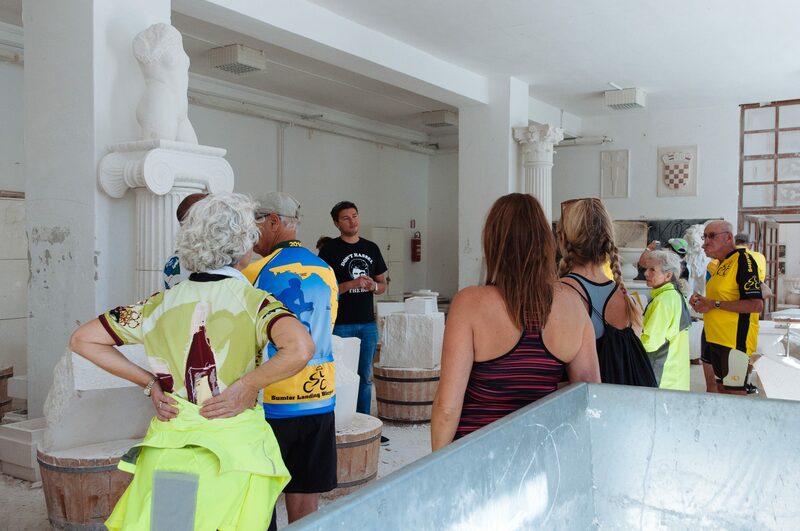 Pucisca’s most unique attraction is its stonecutter’s school, where the main material worked on is limestone which the island is famous for. The quality of limestone from Brac Island is actually so good that it was exported to the United States to be used in parts of the White House in Washington, D.C. The stonecutting school looked exactly like the images I had conjured up in my head: huge chunks of stone everywhere, piles of rock shavings and T-squares. What was most impressive to me is that the students use all manually powered tools like they would have centuries ago. Touring the stonecutter’s school in Pucisca. On our last day on Brac, the group’s hard work was rewarded with a trip to the famous Zlatni Rat, or Golden Horn beach in Bol, on the southern coast of Brac. The weather was perfect, as it was sunny but not hot, and despite the water being a little chilly it seemed to remedy everyone’s cycling aches and pains. What makes the beaches on this island unique is that instead of sand, the beach is a mixture of varying sizes of pebbles. I found the best way to enjoy them was to lay down on the smaller ones near the water’s edge and the rocks provided an acupressure release of sorts. This, in combination with the lapping waves, almost lulled me asleep until I heard someone murmur the magic word…cappuccino. After a relaxing light lunch in Bol we all boarded a small chartered ferry for our second stop of the biking tour, the island of Hvar. The VBT group ferrying from Brac to Hvar. We arrived in Hvar Town (the island’s capital), where our hotel was located, in late afternoon. The cafes lining the harbor were starting to fill up with patrons and the smells of coffee brewing and wine aerating began to fill the air. At sunset everyone met in our hotel’s courtyard so that we could all walk together to an intimate cooking lesson at a nearby chef’s home. Chef Ante Vucetic, our host, was incredible. When we arrived, he invited us into his garden for a small tour—tasting this plant and smelling that fruit along the way. We passed several jars of small-batch, flavored brandy on our way back to the dining area where there were some of those brandies chilled and waiting for us. Our dining table was in view of Ante’s outdoor kitchen and as he explained his cooking philosophy he also explained what he would be preparing for us: a starter of a tomato based stew-like dish called salsa (pronounced shalsha), and a delicious grilled tuna steak rubbed with olive and spices accompanied by some lightly mashed potatoes and buttered green peas. 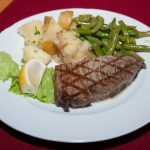 The flavors were nice and simple, but the quality of the ingredients really made these dishes shine. On top of these dishes I use a liberal amount of some of the best salt I have ever had, which Ante had gathered from rocks lining the sea…impeccable flavor. The meal was one of my most memorable highlights and Ante made our evening incredibly special. The tour of Croatia was coming to an end, but I still had one more day of cycling ahead of me. The main destination for the day was the Stari Grad, a quiet village on the northern side of Hvar. But before that, the planned route would have the group cycling around the town of Brusje. Despite the intense sun, the sea breeze traveling over the island kept everyone cool. The terrain looked a little different on this part of the island, as it resembled arid desert and was less wooded— apparently perfect for growing lavender. As I made my way up the last portion of the hill I spotted the rest of the group on the side of the road interacting with a woman selling lavender products. Some were buying cycling jerseys decorated with lavender and some smelled the different essential oils on display. 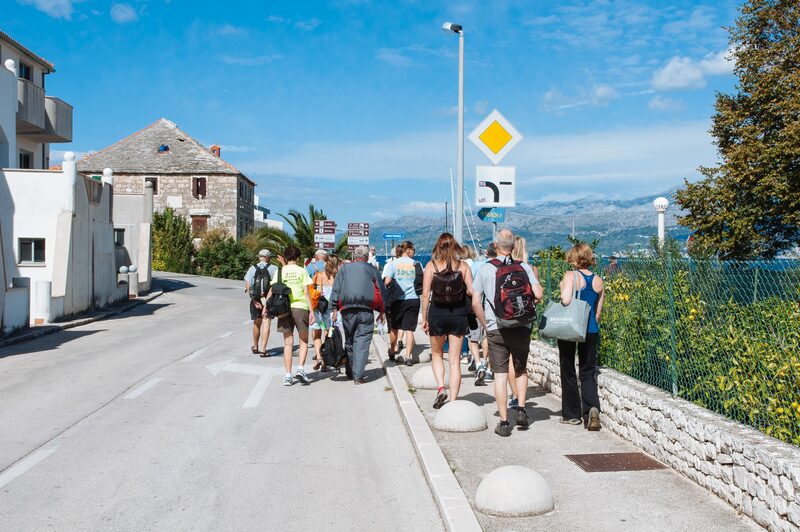 The group pressed on toward Stari Grad, a tranquil destination that is very small and easy to navigate on foot. I spent my time wandering the cobblestone back alleys and peaking my head into boutiques and artisan shops. I stopped at one of the many small bakeries and had a lunch which consisted of a jam filled pastry and milk, and if I wouldn’t have had to bike back home I can assure you I would have had another round. VBT members taking in another beautiful view. That evening everyone met near the Hvar Town harbor for a farewell dinner and as we sat dining on fresh seafood and delicious Croatian wine we listened to the sounds of the peaceful Adriatic. I had been biking for roughly a week straight but I didn’t feel sore at all, I was actually thinking about how I would miss my bicycle, and the daily route reviews with our guides. Being with a group of people all driven to complete a physical challenge was something I missed. The comradery I felt on this trip was incredible and it will be a feeling that I carry with me for some time to come.